Joining a syndicate increases a lottery player’s chance at winning. What makes it even more attractive is that every win makes a lot more people happy instead of just one. 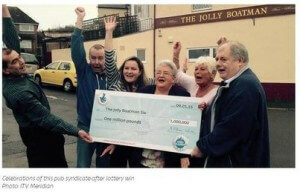 A six-person syndicate composed of owners and regulars at The Jolly Boatman pub in Lewes Road in Newhaven are very happy about the £166,000 share each one gets from a million pound Euromillions win. Pub landlady Charlotte Maynard and her mother Mary Maynard combined for a third of the jackpot while pub regulars Michael Read, Michael Fowler, Michael Skinner and Maureen Daly, each had a sixth share. There is no word yet on how they plan to use their money but since they are all connected by a pub, it is not hard to guess what form their celebrations will take.